HOUSTON - Venezuelan state-run oil company PDVSA is moving millions of barrels of oil from a Bahamas storage facility after terminating a contract with the owner, U.S. Buckeye Partners LP, according to internal data and sources close to the decision. Buckeye and PDVSA had tried to resolve payment delays and other frequent problems that stalled some shipments, the sources said. But PDVSA decided to shift its oil to the Statia terminal, operated by U.S. NuStar Energy LP, in the neighboring island of St. Eustatius. The termination is another sign of how PDVSA's deteriorating finances have strained its relationship with business partners. The state-owned company has struggled to maintain its tanker fleet on the water and to keep operations running to maximize income for the country's most important export: oil. PDVSA's contract with Buckeye had included storage for up to 6 million barrels of crude and fuel oil. The contract was due to expire in December, but PDVSA decided to end the lease in advance and seek some $10 million in overpayments, according to a source from the Venezuelan company. Buckeye and PDVSA did not respond to requests for comment. NuStar said it would not discuss customer activities at its terminals. Since 2016 Buckeye had intermittently suspended PDVSA from moving its stored oil out of the terminal - the Caribbean's largest - over monthly payment delays, according to sources from the companies and Thomson Reuters Trade Flows data. In late August, PDVSA renewed a 2014 contract with NuStar to secure its presence in Statia for three more years starting in March. The state-run company is now paying some $2.3 million per month to lease 5 million barrels of crude storage excluding extra charges, according to a document seen by the international news agency Reuters. PDVSA's supply and trade department last year also approved an option to lease a single buoy mooring in St. Eustatius and extra storage capacity for up to 4.3 million barrels of refined products. "We are now consolidating blending and storage operations in St. Eustatius," the PDVSA source said. 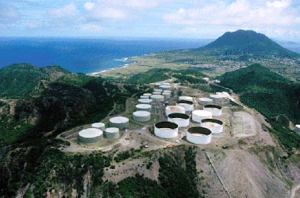 NuStar's Statia terminal has capacity to store up to 13.03 million barrels of crude and products. It also has six mooring locations, blending and transshipment facilities. In 2011, PDVSA announced a plan to increase storage capacity nearly fourfold in three years to handle new production of blends made from the Orinoco Belt's crudes. Since then, it has rented facilities in the Caribbean, but payment problems have recently affected its operations in several islands. PDVSA operates the 335,000-barrel-per-day Isla refinery in Curaçao and an adjacent terminal. It also owns the BOPEC storage terminal in Bonaire, leases the Aruba refinery and its terminal through its subsidiary Citgo, and has stakes in refineries in the Dominican Republic, Jamaica and Cuba. Buckeye's Bahamas terminal was owned by PDVSA until 2008, when it was sold to investment firm First Reserve Corp. In 2010, Buckeye bought 80 percent of the facility, which can store up to 26.2 million barrels of oil. Buckeye also owns terminals in St. Lucia and Puerto Rico.